Delineation of the Conformational Thermostability of Hyperthermophilic Proteins Based on Structural and Biophysical Analyses. Role of Packing, Hydration, and Fluctuations on Thermostability. Analyzing Protein Rigidity for Understanding and Improving Thermal Adaptation. Thermostable Subtilases (Subtilisin-Like Serine Proteinases). 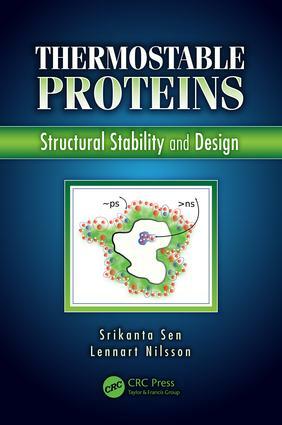 Combined Computational and Experimental Approaches to Sequence-Based Design of Protein Thermal Stability. Designing Thermophilic Proteins: A Structure-Based Computational Approach. Index. Dr. Srikanta Sen is currently working as a Senior Fellow at Chembiotek, a TCG Life Sciences group of companies in India. He has developed the Molecular Modeling and Computational Biology group of Chembiotek and has been leading the group for the last ten years. He received his M.Sc. degree in physics from Calcutta University, India. He pursued his Ph.D. work at the Theory Division of Saha Institute of Nuclear Physics, Calcutta and received his Ph.D. degree in Physics in 1991 from Calcutta University. He did his post-doctoral research between 1992 - 1998 at Umea University, Stockholm University and Karolinska Institute in Sweden. He then worked in Indian Institute of Chemical Biology in Calcutta, India for two years. He moved over to Chembiotek in 2001. His research interest includes application of statistical mechanics to biomolecular systems; molecular modeling based investigations of structural, dynamical and interactional behaviors of biomolecules and their complexes; protein design; pharmacophore modeling; molecular docking and virtual screening of compounds to find leads in drug discovery projects; drug design; as well as QSPR based prediction of properties of compounds from their structures. He has also developed many computational tools to facilitate the research work of his group. Prof. Lennart Nilsson is currently working at Karolinska Institutet, Stockholm, Sweden, where he leads a research group in Molecular Modeling since 20 years. He obtained his M.Sc. degree in engineering physics as well as his PhD in theoretical physics (1983) from the Royal Institute of Technology, Stockholm. He did his post-doctoral research 1983-1984 at Harvard University.